What makes Golden State one of the best teams in NBA history? LeBron James and Cleveland found out in Game 4. CLEVELAND — When you think of the signature traits of the Warriors, none of them quite do justice to the most successful team in NBA history. They have two of the best three-point shooters of all time, but the Cavs entered the Finals hitting more threes than any other team in the playoffs. Golden State has one the most captivating offenses in NBA history, but so did the Steve Nash Suns. They play small ball, but so do half the teams in today's NBA. Game 4 got us closer to truth. What really sets the Warriors apart is that they're faster, smarter, and tougher than any team in the NBA. You can take away a few of those advantages for a game or two, but over the course of seven games in two weeks, it starts to get impossible. Golden State pulled out a 108-97 win Friday night, earning a dominant 3-1 Finals lead with the series shifting back to Oracle. The Cavs looked flat–out exhausted by the fourth quarter. Kyrie Irving looked like he might pass out, LeBron James looked old and frustrated, and role players like J.R. Smith and Iman Shumpert were invisible. The Cleveland defense that had slowed Golden State the first few games was suddenly giving up wide-open looks on every other possession, and the offense was reverting to lazy pull-up jumpers and iso-ball from Kyrie. There are plenty of people who will blame Cleveland's loss on the Cavs themselves—we're about to have another national referendum on LeBron, definitely—but I'm not sure it works this time. The Cavs were awful in the first two losses, but they were locked in on both ends of the floor Friday. The problem is that "locked in" against these Warriors means chasing shooters all over the court for 48 minutes. It means dealing with split-second closeouts from Draymond Green and Andre Iguodala, and the whole time, trying to go shot-for-shot with the best offense ever. I don't blame LeBron for running out of gas after 46 minutes in this torture chamber. This is what Golden State does to teams. Stephen Curry helps, too. He's either the catalyst for everything else, or the one ingredient that makes it all truly unstoppable, but either way, he blew things up Friday. He had 38 points, including several death blows near the end to short-circuit any Cavs comeback attempts. He fought through screens, he got rebounds and putbacks, and the threes finally fell. "He's the MVP for a reason," Steve Kerr said afterward. ​The Steph revival didn't happen immediately. He started off with a solid eight points in the first quarter, but even so, they came with a handful of turnovers, frustration against Tristan Thompson and even an airball. For a few minutes, I began to wonder if the Warriors were actually beatable. Not just in the game, but the series. 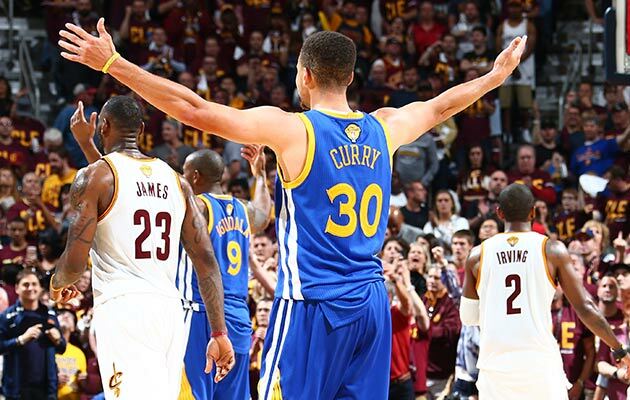 Curry had been struggling, the Warriors had looked tired and flat against the Thunder and again in Cleveland, and maybe they were just beaten up enough to give the Cavs a shot. The Cavs went up eight in the third quarter, and with the entire stadium vibrating, it looked like this series would be tied heading into Monday's Game 5. Then Curry came back. He hit two threes, Klay Thompson hit another, and two minutes after Cleveland finally opened the game up, its lead was down to two. It was a reminder of how demoralizing the Warriors can be. The Cavs were doing everything right— and it really didn't matter. After averaging 28 points combined the first three games, the Splash Brothers exploded for 63 in Game 4. "They went up eight," Draymond Green said. "We really turned it on and pushed the ball. We hit a couple of threes in transition. From there, there was no looking back." "We always feel comfortable," Kerr added, "that if we're competing and defending over 48 minutes, we're going to break loose at some point offensively." I'm pretty sure that Kerr's point is the Warriors' greatest advantage. When things get tight, the Warriors don't overthink anything. The offense stays the same, they keep shooting the same shots, and eventually it works. It's a smarter way to approach basketball, but it also requires an almost inhuman detachment from pressure. "For 48 minutes we executed a lot better," Curry explained afterward. "I think we got back to enjoying the process and the challenge of winning playoff games." It saved them against OKC, and against Memphis last year, and for the second year in a row, it buried Cleveland in a Game 4. They hit 17 threes by the time it was over. While we wait for Game 5, there was one more development to mention from Friday. ​That was the best game of the Finals, obviously. It was close until late in the fourth quarter, and it felt like the Cavs' last stand. It was also physical as hell, with hard fouls, and post-whistle trash talk that mounted as things unfolded. And it's telling that Golden State wound up getting better as it all got uglier. That's how the game got out of hand. It wasn't the "jump-shooting team" that started settling for lazy pull-ups in the fourth quarter, and it's never been "going small" that allows the Warriors to drive everyone nuts. 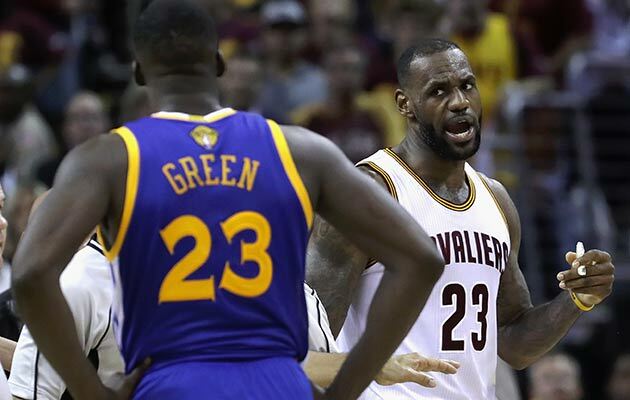 The real problem for the NBA is that Golden State can go small with Draymond and Klay and Iguodala, and still be tougher than guys like Kevin Love, LeBron James and Tristan Thompson. Meanwhile, there was Curry, the MVP who fought through screens, got his looks, and broke the game open.